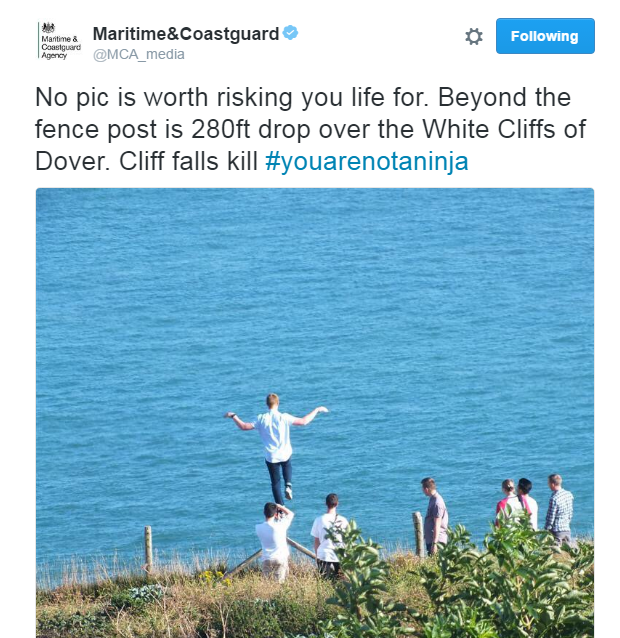 Coastguards are warning teenagers to stay behind the fence posts after group spotted close to edge of White Cliffs of Dover near to 200ft drop. Maritime and Coastguard Agency have issued the warning after Dover Coastguards took this picture. Coastguards say this picture was taken a few days ago by our Dover Coastguard. Beyond the fence post that this teenager is standing on is just under a metre of ground before an 80ft drop to a ledge followed by a further 200ft drop to the bottom of the White Cliffs of Dover. we want you and yours to come home again after a day on the coast. If you see someone in danger on the coast, remember call 999 and ask for the Coastguard.